It’s been a quiet summer on the blog, but we’ve been hard at work improving BioGPS behind the scenes. Much of our recent activity has been on small-scale bug fixes and improvements, but we have a few major items slated for release soon. 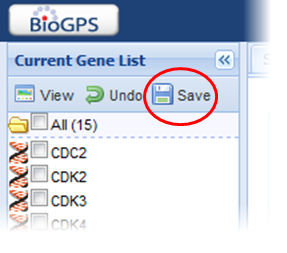 We’ve just added the first of these new features — the ability to save gene lists. If you find yourself juggling many different gene lists of interest, then you can now keep them organized and easily switch between them. We also provide you with the tools to do simple set operations. Look for more ways to use gene lists in the future. I've been studying a list of housekeeping genes and was wonderinng what tags Novartis was using to identify genes in different tissues. SAGE specifies a 10bp sequence so one can see if it's possible that a gene may have been mis-identified; there's a lot of genes one would really expect on a housekeeping list which aren't there (ie' variouss cyclins, certain bits of ribosomes). (Sorry for the late reply…) Our gene expression data is based on Affymetrix microarrays. In brief, each chart corresponds to one "probe set", each probe set is comprised of ~11 "probe pairs", each probe pair has two "probes" (that differ only by a central base for background subtraction), and each probe is a 25-mer oligo. For more info, you can see this publication and the cited references, or the Affymetrix web site.